How do you come to the idea of becoming a professional recorder maker? How do you learn the basic techniques? How does it feel when your first instrument is ready? 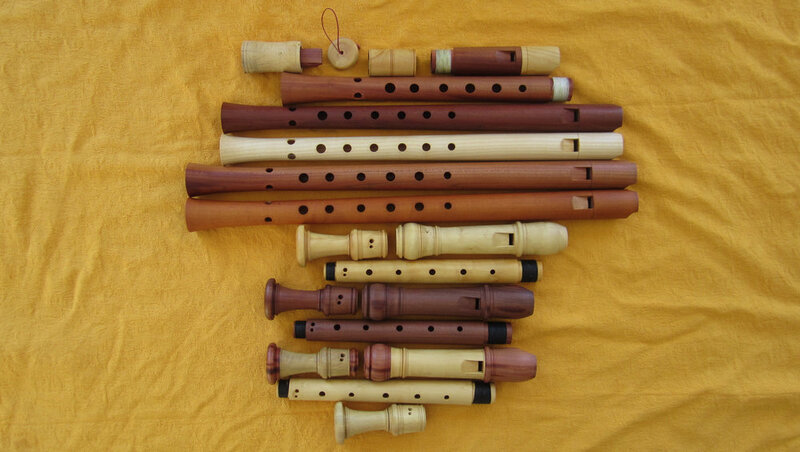 Which size and type of recorder do you build first, and why? How do you bridge the gap between historical instruments, primary sources and current performance practices? In search of answers to these questions and more, I spoke to three young recorder makers: Lorenzo Lio (Italy/Switzerland), Marco Magalhães (Portugal/Netherlands) and Fernando Paz (Spain/Portugal). This interview was originally published in the Dutch recorder magazine Blokfluitist in September 2016. It seems one can recognise a future recorder maker from a young age. As a teenager, Fernando Paz was – in his own words – a “Mr. Fixit who made and repaired furniture at home”. Lorenzo Lio loved painting and building miniature boats and the sixteen-year-old Marco Magalhães already fine-tuned the blocks of his recorders following the advice of his teacher, Pedro Sousa Silva. How did you all start making recorders? Who gave you advice? FP: During my studies at the conservatoire I was already very interested in instrument-making. Over the years I collected lots of information, tools and wood. I made new blocks for my recorders and gained experience adjusting the voicing. Although I took a couple of block-making courses with Jacqueline Sorel and Heiko ter Schegget, I see myself mostly as self-taught. However, I've had many instructive conversations with Monika Musch, Joachim Röhmer, Ernst Meyer, Adrian Brown, Bob Marvin, Fumitaka Saito... Outstanding makers with very different standpoints. From them I have learnt that there is more than one “right way” to build good recorders. In 2011 I left the music school job I had for eighteen years to work full-time on my instruments. Two years later I sold a recorder for the first time. LL: For me it all started with a three-day block-building course with Heiko ter Schegget at the Royal Conservatoire in The Hague. I had no experience at all and made many mistakes with terrible consequences, including a cracked headjoint! Still, it was a great way to get started. The course helped me let go of the feeling that an instrument is “untouchable”. After finishing my postgraduate degree in Lausanne, I decided to start working seriously as a maker. Flavio Casanova, a Swiss engineer and maker of baroque oboes, taught me some basic techniques – cutting wood, drilling holes... I also took a course on carpentry and metalwork. I learnt to use various machines and to make my own tools. Fumitaka Saito, a Japanese recorder maker living in Amsterdam, also gave me lots of good advice. I find his work very inspiring: he makes wonderful instruments with the most simple means. For instance, Fumitaka cuts the wind channel by hand, while others use a special tool to make the process faster. MM: I also got to know Fumitaka during my studies in Amsterdam. We play together in Aventure, an ensemble for late medieval music. I asked him if he would help me to make a new block for one of my recorders, and he accepted. He taught me the basics and by the end of 2009 I had not only made a few blocks, but also my first recorder. I also learned a lot from Adrian Brown. Amongst other things, Adrian helped me to make the special tool to cut the windway that Lorenzo just mentioned. This makes my work faster and more efficient, which is important because I also work as a teacher and performer. Which aspects of recorder making do you find the most challenging? LL: Indeed! When I started I found making my own tools very difficult. But I would say the biggest challenge is finding the “voice” of an instrument – that is a lifelong quest. As Fernando just mentioned, all aspects influence one another. It is not always possible to predict how an instrument will work. Every piece of wood is different and will react and develop in its own way as you play the instrument in. Plus, your own taste also develops over time! MM: I absolutely agree. It is very difficult to find the exact procedure to change the sound of an instrument according to your wishes. How does your work relate to historical performance practice? FP: I try to make recorders that are as practical as possible, but also loyal to the historical sources. In my opinion, recorder players often pay insufficient attention to the right instrument choice for each repertoire, while they are well aware of other aspects of historical performance. I also notice that many professionals overlook the use of original fingerings, pitch standards and temperaments and tend to look for the same sound ideal – homogeneous, strong and well-balanced – on all recorder models, from medieval to baroque. I hope that the next generations of makers and players will become more sensitive to this issue and make well thought out decisions. Anyhow, the market puts some pressure on the work of an instrument maker and it is complicated to find a good balance between your own vision and the wishes of your clients. In this sense I increasingly admire the work of masters like Bob Marvin or Adrian Brown, who make no concessions regarding the purity of their models. LL: Building an instrument is a very personal process. In the past too, each recorder maker had their own method. When I develop new models I find it important to get a good impression of the original instrument and the aesthetics it represents. I also wonder how the instrument sounded when it was new. 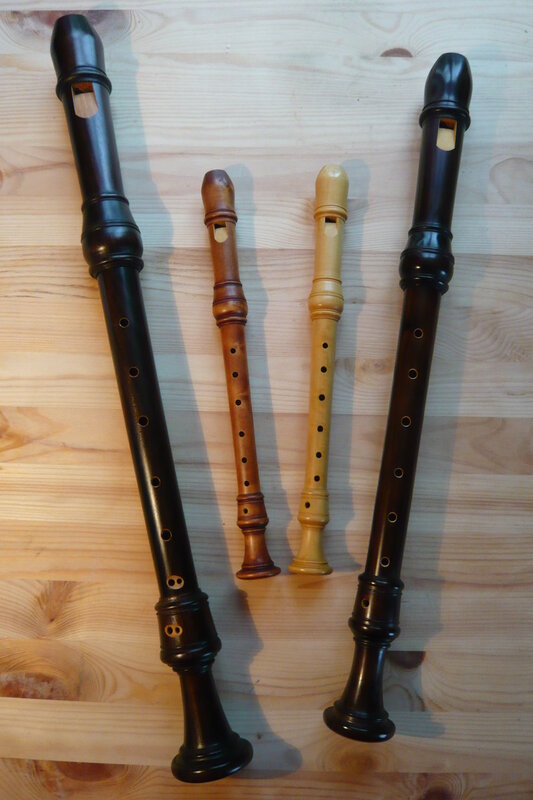 Most historical recorders have been damaged or altered with the passing of time. It is the responsibility of the contemporary maker to keep the character of the original while achieving a personal result. An example: I make treble recorders after Thomas Stanesby Sr. The original is tuned at A=404Hz. The sound is so special that I chose to keep the original length. Is there such a thing as “the ideal sound”? LL: It's difficult to describe sound... I like comparisons between music and other art forms. Do you know the famous sculpture by Michelangelo, La Pietà? This may be one of the most sublime works of art ever created. If I think of “ideal sound” this is the beauty that comes to my mind: solid but at the same time transparent and colourful, like a crystal. MM: Indeed – and I would add that the ideal sound differs per instrument. Each model has special characteristics and its own character. As a maker, I try to bring those forward, although I notice that, sometimes, being a performer myself can be a slight disadvantage when it comes to sound. I play on my own instruments in a way that suits me naturally, with the risk of overlooking other possibilities. Each musician plays differently. Therefore it is important to distance oneself from one’s own taste. FP: My ideal sound has richness and focus with some flexibility. Homogeneity is not my priority, I prefer to hear varying colours in each tone and register. My work as a maker has taught me to value the heterogeneity, nasality, colour and purity of sound of the old recorders. As I mentioned above, I notice a general taste for a "modern recorder" that seems old but is actually very powerful and flexible. There seem to be few recorder players who are willing to adjust to instruments that demand flexibility and hours of practice. Which models did you make first and how has your catalogue grown since then? LL: I made a copy of one of my own instruments, a “Ganassi” descant. I made this choice because the bore is relatively simple – cylindrical with a slight flare under the last fingerhole – but also because I had to work with simple means. I still offer this model in my catalogue, with joints in A=415Hz and A=440Hz. Later I started making trebles after Denner and Stanesby Sr. in A=404Hz and after Stanesby Jr. nearer A=415Hz. At the moment I mostly build baroque recorders. FP: I also started with a “Ganassi”, in my case a G-alto. I am a passionate player of Renaissance recorders and I thought, like Lorenzo, that this model would be relatively easy for a beginner. Soon I realised this was not the case. The typical “Ganassi” recorders that most people know are based on a design of the Australian maker Fred Morgan, developed in the 1970s. I started wondering about the historical basis for these instruments and studied the recorder with catalogue number SAM 135 in the Kunsthistorisches Museum in Vienna. Presently I offer two different G-altos. One is based on Fred Morgan's design: in two parts, with a metal ring and bodies in A=415, 440 or 466Hz. The second is based on SAM 135: in one piece, with nine fingerholes, historical fingerings and a very suitable sound for consort playing. The process has been long but it has also offered me new insights. MM: My first recorder was a treble after an original by Jacob Denner in the Musikhistorisk Museum in Copenhagen. Fumitaka Saito felt that this instrument would suit my taste and he was right! How important is the appearance of an instrument? FP: Very important. It reflects how the whole instrument is constructed. MM: Indeed! Interior and exterior are equally important. When you design an object, whether it is a car or a recorder, you want it to look beautiful. Every historical maker built instruments with distinctive shapes which I try to reproduce in detail. You can learn a lot about the quality and elegance of the old masters by looking into their refined decorations and finishing touch. At the moment, do you see yourselves as makers, performers, teachers... or all simultaneously? FP: All three, but not really simultaneously – I can't manage that. When I have concerts coming up, I stop building and spend time practising. I mostly teach intensive courses or masterclasses, although in fact the last years I have spent most of my time in the workshop. However, I still make music every day and I play on my own recorders for days and weeks before I deliver them. MM: I try to combine all these activities. There are many points of contact between performance, instrument-making and teaching. When you are busy with one of these activities, the other two get better. I like making instruments for friends, for colleagues who can give me feedback and for clients, but luckily I don't need to build under time pressure. This gives me enough flexibility to teach and perform on the side. LL: At the moment I work mostly on my instruments and try to invest time in my development as a maker. I also have a job at the Swiss recorder factory Küng, where I take care of voicing. The basic models already play when they come out of the machine and my work is cleaning and refining the windway. The professional models demand more work. I also love playing concerts, certainly on my own instruments. I am a member of recorder quartet Ex ligno voces and ensemble Festeggio Armonico which I founded together with harpsichord player Franz Silvestri. I also teach an afternoon a week – it may seem little, but I really love it! Is there enough attention given to instrument-making and maintenance at conservatoires? FP: I don't think so. It seems logical to me that conservatoire students learn how to take care of their instruments and that they are introduced to the rudiments of instrument-making and to the development of the recorder through the centuries. Examples like the class of Heiko ter Schegget in Utrecht, where all students make at least one block during their study, should not be an exception. FP: I continue working on new models to expand my catalogue. I recently added a voice flute and a treble after Bressan, both at A=415Hz. I am also busy developing Renaissance tenor recorders in C and in D. Last summer I spent a couple of weeks at Bob Marvin's home in Canada and learnt a lot from him. This profession demands full commitment besides passion and perseverance. I see myself as a beginner, for sure, next to some of my esteemed colleagues who have been making recorders for decades! MM: My catalogue consists mostly of baroque recorders. At the moment I am working on a few new models: a treble in A=392Hz, a bass in A=415Hz after an original by Jean-Hyacinth Rottenburgh and a baroque treble in G after Klenig, a fairly unknown German maker. I perform regularly with Aventure, The Royal Wind Music and as a duo with harpsichordist Pietro Paganini. Besides, I teach four days a week in Amsterdam. LL: I am also busy developing new models for my catalogue, among them a special voice flute after an original by Joseph Bradbury which, as far as I know, has not been copied yet. I was lucky to study and play this instrument in Edinburgh. After a few minutes it sounded beautiful and dark, with a good response in the high register. I am also busy with a sixth flute (descant in D) and a treble in A=440Hz. My wishlist is much longer, of course. There is always so much to do...! María Martínez Ayerza studied recorder and musicology in Sevile and Amsterdam. She is a fervent player of consort and ensemble music with her ensembles Seldom Sene, The Royal Wind Music, ÆroDynamic and Audi Alteram. María is Recorder Consort Professor at the Royal College of Music in London and has taught courses and masterclasses in Europe and Australia. She is chief editor of Blokfluitist, the only specialised recorder magazine published in Dutch, and member of the direction of the Open Recorder Days Amsterdam, a four-day international festival and competition. Feb 6 Meet...Team Recorder on YouTube with Sarah Jeffery! Feb 6 Ensemble Hesperi - Scottish Baroque Music: Your Questions Answered!